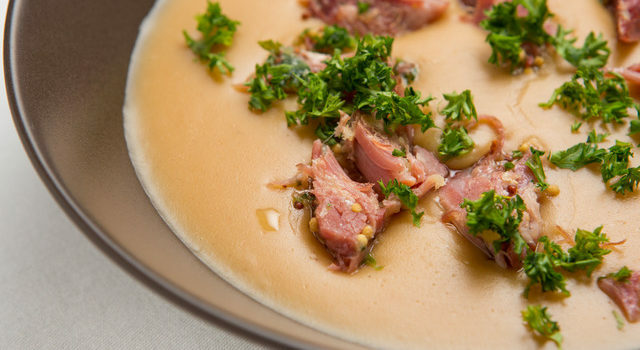 Our Chef Alliance member Neil Forbes has shared a delicious recipe: Peasemeal and Hamp Soup. Sure, it is summer, but here in Scotland, there are enough cool days to enjoy a hot bowl of soup. Boil the stock or water and season with salt and pepper. Add the butter. Next, add the peasemeal flour to the hot liquid and whisk vigorously for a few minutes. Check the seasoning and add more butter if required. Let it bubble for a minute then pour into warm bowls. If it seems too thick, just add a little more liquid. Crumble on the ham, gammon or hock and garnish with the chopped parsley. Serve steaming hot. Tempted to make this recipe? Find out here where to find Ark of Taste Peasemeal.